Bronze Valley Board of Directors members gathered to discuss the mission of Bronze Valley, the challenges ahead and how success will be defined in the years ahead. Bronze Valley Executive Director Neill Wright joined board members John Hudson and Herschell Hamilton in a panel discussion moderated by Alabama Power’s Staci Brooks. John Hudson serves as senior vice president of marketing and business development at Alabama Power. Hamilton is co-founder and chief strategic officer of BLOC Global Group. The conversation began with a simple question – Why is now the right time? “With the work I do in economic development, I think it is time to start looking at attracting industry across the Southeast and there are plenty of opportunities for underrepresented companies to participate,” said Hudson. When identifying what it will take for Bronze Valley to be successful, Wright reinforced the importance of taking the initiative beyond conversation. The three panelists weighed in on the potential obstacles that Bronze Valley could face. “I don’t think this is a big issue. I am convinced that people that invest in companies are often color blind. They just want to see really good ideas. What we are going to do is bring good ideas to the forefront and put enough advisors around them so that those companies can be best presented,” reiterated Hudson. “It comes down to figuring out value proposition, what at the end of the day you are trying to raise money and capital for. It is all about scaling, they don’t care what color you are, they just want to know you have an idea that can scale,” said Hamilton. “With that in mind, we had a lot of conversations around what kind of companies we are trying to help. We definitely are going to be focusing on Alabama-based companies but are not limited to that. The idea is to lift up businesses that are good businesses – lifting up companies that can scale. We want investment-grade companies that we can help take to the next level,” said Hudson. How is Bronze Valley defining success in five, ten years? 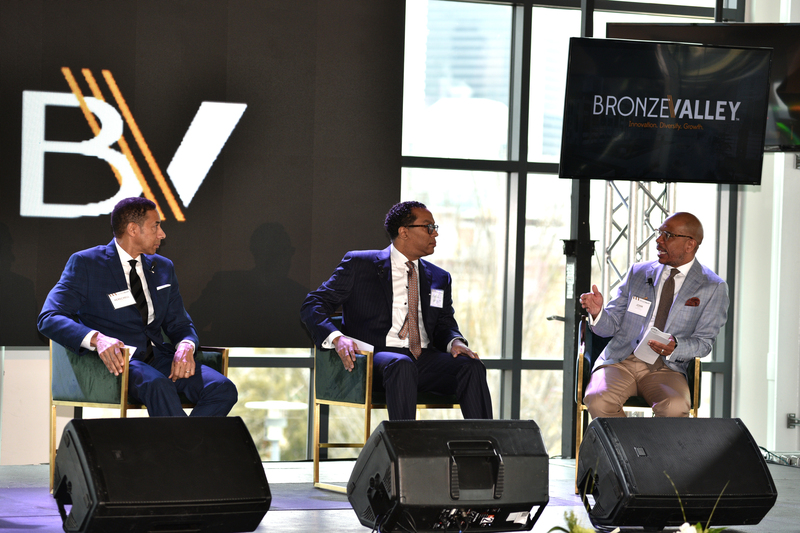 “In the future, I see Bronze Valley as an access point that really connects entrepreneurs of color with all the resources they need to really succeed,” said Hudson. “One of the things you hear from time to time from investors who want to invest in diverse companies is that they don’t see a lot of them, that they don’t have access to them. I think ten years from now, we want to see Bronze Valley having identified those types of companies and investors getting the return on their investments that will help fulfill our mission,” added Hamilton. Lastly, the panelists weighed in on workforce development and the role education plays into Bronze Valley. “At the end of the day – we have to work among other things with the education system. We have to work with the education system to bring them up to speed so that they are teaching students so they understand what tomorrow’s opportunities are,” identified Hamilton. “It is about exposure. If we don’t expose them to opportunities then they will not be equipped to enter the workforce,” added Wright. “That is a focus for us. If you really think about it, if we are trying to make our community better, improve the tech industry, data centers, tech companies, the city’s economic development efforts would want to recruit tech companies. The question is do you have the workforce? We have work to do in that space,” added Hudson. With the launch of Bronze Valley and a strong board of directors at the helm, change is on the horizon for new business and investment across the Southeast.